Exceptional 5 bedroom villa located on the hills of Monte Pego. With a total built area of ​​372m2, this one- storey house is built on a fenced landscaped plot of 1200m2 and offers superior level of equipment and materials. We enter through a beautiful entrance hall overlooking a large lounge / dining room open on the covered terrace. The kitchen adjoining the living room has a double sliding door to enjoy a large living space or separate kitchen as needed, a laundry room and direct access to the terrace. The sleeping area consists of a separate toilet, two very large double bedrooms, a bathroom with toilet, shower, double sink and jacuzzi bath and a large dressing room. Upstairs are the other three large double bedrooms, all with access to the terrace, and two bathrooms with hydromassage showers and WC. You will also appreciate the easy and direct access to the south-facing terrace to enjoy the sun all year and the 9x5m swimming pool. 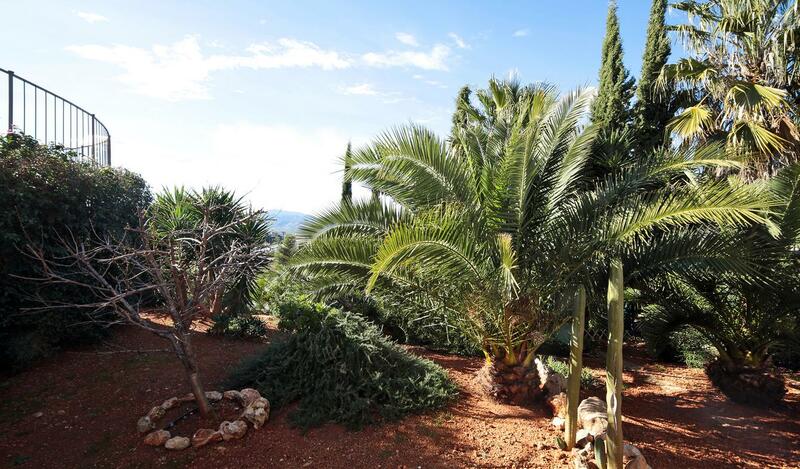 The garden is beautifully landscaped with Mediterranean plants, fruit trees and palm trees. It has an automatic watering system. In the basement of the villa are the double garage with automatic door and a large storage space. Ideally located, sold fully furnished and in immaculate condition, it has high-end equipment: heating, air conditioning, double glazed windows and mosquito nets, ceramics, marble, double garage with automatic door, automatic watering, outdoor shower, alarm, large pool, internet, TVsat, laundry, panoramic views of the hills. The residential area of ​​Monte Pego located on the heights of the protected natural park of Marjal is 10 minutes from the sandy beaches, Oliva Nova golf course and its international equestrian center and 20 minutes from the golf course of La Sella.